Nature impressively teaches us what the ideal propulsion systems for certain types of movement in water look like. 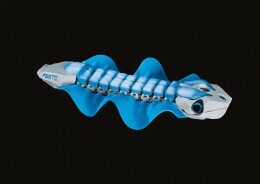 For the latest concept from the Festo Bionic Learning Network, the bionics team was inspired by the undulating fin movements executed by marine animals such as the polyclad or the cuttlefish and created the BionicFinWave. 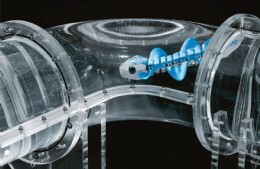 With this form of propulsion, the underwater robot manoeuvres itself autonomously through a system of acrylic glass tubing. This project is providing impulses for future work with autonomous robots in the process industry. With this technology carrier, Festo is once more creating impulses for future work with autonomous robots and new drive technologies for use in fluid media. Concepts like the BionicFinWave could possibly be further developed for tasks such as inspection, measurements or data acquisition � e.g. 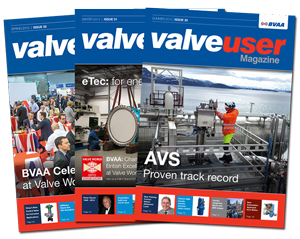 for water and wastewater technology or other areas of the process industry. The knowledge gained in this project could also be used for methods in the manufacturing of soft robotics components. The longitudinal fins of the polyclad and the cuttlefish extend from the head to the tail � along their backs, their undersides or the two sides of their torsos. To move through the water, the animals use their fins to generate a continuous wave that progresses along the entire length of their bodies. This so-called undulation forces the water backwards, thereby producing a forward thrust. The BionicFinWave also uses this principle to manoeuvre itself forwards or backwards. This has enabled Festo to technically realise a fin drive unit that is particularly suitable for slow, precise motion and causes less turbulence in the water than a conventional screw propulsion drive, for example. While it moves through the tube system, the autonomous underwater robot can communicate with the outside world via radio and transmit data, such as temperature and pressure sensor readings, to a tablet. The two lateral fins of the 370-mm long BionicFinWave are moulded entirely from silicone and dispense with reinforcement struts and other supporting elements. They are therefore extremely flexible and can realistically emulate the gently flowing movements of their biological model. To carry out the movement, each of the two fins is attached to nine small lever arms with a deflection angle of 45 degrees; these are driven by two servo motors housed within the body of the underwater robot. Two flat crankshafts transmit the forces to the arms, so that the two fins can move independently of each other; by this means, they can simultaneously generate different wave patterns. To swim in a curve, for example, the outer fin moves faster than the inner one � as with the treads of an excavator. 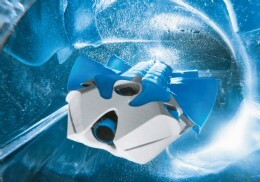 The BionicFinWave moves upwards or downwards by bending its body in the desired direction. To make the crankshafts suitably flexible, universal joints are located between the lever segments. The crankshafts, together with the joints and piston rod, are made from plastic as integral components in a 3D printing process. The remaining body elements of the BionicFinWave, which weighs only 430g, are also 3D-printed; this enables the complex geometry to be realised. With their cavities, the body elements function as floats. At the same time, the waterproof cavities offer a safe location for the entire control and regulation technology within a very small space. A pressure sensor and ultrasound sensors constantly register the BionicFinWave�s distance to the walls and its depth in the water, thereby preventing collisions with the tube system. This autonomous and safe navigation required the development of compact, efficient and waterproof or water-resistant components that can be coordinated and regulated by means of appropriate software.